Learning disability nurses play a leading role in the care and support of people with learning disabilities. Learning Disability Nursing explores the theory and practice of learning disability nursing, with an emphasis on understanding the experiences of learning disability nurses as they seek to practice effectively. It examines key issues faced by people with learning disabilities and those who support them and promotes the role of knowledgeable and reflective practitioners. * Supports learning disability nurses in developing their roles and to support those with learning disabilities in exercising their rights. Chapter 1. Discovering Learning Disability Nursing. Chapter 2. Getting the Balance Right: The Issue of Rights and Responsibilities in Learning Disability. Chapter 3. A Partnership for Health: Respecting Choice as Part of a Healthy Lifestyle. Chapter 4. Getting the Message Across: Exploring the Functions of Challenging Behaviour. Chapter 5. 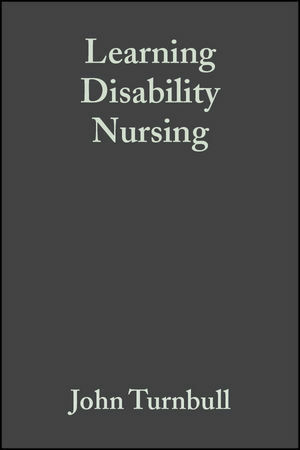 The Purpose and Practice of Learning Disability Nursing. Chapter 6. Lending an Ear: Helping Someone to Speak Out. Chapter 7. A New Start: Earning the Trust of a Family. Chapter 8. A Home of Their Own: Supporting a Tenant’s Group. Chapter 9. The Relevance of Learning Disability Nursing. Chapter 10. Taking a Step Back: Tackling Women’s Health Issues in Learning Disability. Chapter 11. A Shock to the System: Improving Encounters with Acute Health Care. Chapter 12. Getting Life Under Control: Managing Risks from Epilepsy. Chapter 13. Learning Disability Nursing: A Model for Practice. Chapter 14. Sustaining Learning Disability Nursing Practice.